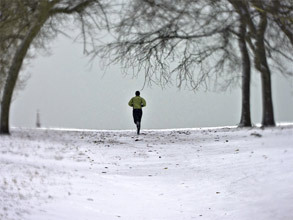 I am the exception to the rule: I actually enjoy outdoor running throughout the winter. But what about you? Do your workouts diminish proportional to the temperature outside? Last year I bought shoes that are more weather resistant than my typical running shoes. This was in reaction to the previous winter when I cam home after numerous runs with damp if not wet feet. That was no fun. So I made and adjustment. I bought the shoes. I made a plan. Do you have a plan? Sometimes when I’m at the gym where I work, I look at my clients (current and former) and monitor their attendance to see if they’re still working out here. This week I noticed three (former) clients hadn’t been to the club in three weeks. I think there’s a lull in the season where workouts fall off our priority lists. Then of course the holidays hit and then our attendance is hindered even more. Take control. Make a plan. If it’s not outdoor running, make arrangements for a different form of cardio. Focus on strength and core for the winter. Whatever it is, don’t allow Mother Nature to determine your plans for working out. This entry was posted in Cardiovascular, Strength, Training on November 4, 2010 by Hans Schiefelbein.